You forgot to download AbiWord	. Click the link below to download it. Every computer user needs to write something, once in a while. No matter if it's about letters, articles or notes, using the computer for writing is definitely something done by everyone. The Windows operating system includes a word processing application named WordPad, but this isn't good enough for most users, as the features are extremely limited. An alternative to this would be installing the Microsoft Office pack and using Word, but, again, this solution has its downsides. Even though Word includes a lot of options and features, it takes up a lot of hard disk space and system resources. Besides that, it's very pricey and the large number of options could be found confusing by a lot of users. The best alternative could be the program AbiWord. 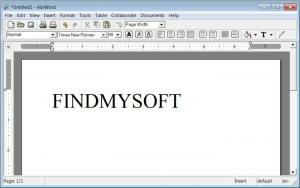 It's a free and open-source word processor that has all the features an average user may need, still being simple enough to be also used by beginners. The installation process of AbiWord is point and click. Compared to other similar programs, AbiWord takes up little hard disk space and requires low system resources for it to work. Launching the program for the first time will display the Release Notes. Thus, the user can make up an idea about the functionality of the software. Some of the program's tasks can be completed using the graphical toolbar, but most of them can only be accessed from the drop-down classical menu. The interface seems very familiar and resembles most other word processors, so users will get used to it in no time at all. The number of file formats supported by AbiWord is quite impressive and exceeds the ones supported by other similar applications. It can even open the newest Microsoft Word format, docx. Beginners or users who would like to write a certain type of document fast can take advantage of the templates feature, which allows them to select templates for various types of writing projects, ranging from business letters to press articles. A feature that cannot be found in other similar programs is the possibility to collaborate with other users and work on a document simultaneously, using the Internet. The functionality of AbiWord can be extended and improved by using various plugins. It comes with some of them included, but more can be downloaded from the Internet. It allows opening and saving in numerous file formats. It also features an option for collaborating on a document. The interface could have been more polished, as the number of graphical buttons is limited and covers only a small part of the program's functions. AbiWord is a great word processor that has all the functions required by the average user.